Partnership brings cutting-edge license plate reader technology to industry-leading VMS. We’re proud to partner with Milestone to bring the life-saving ARES ALPR-based video analytics suite to their clients worldwide. 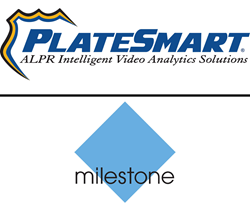 PlateSmart, the creator of award-winning video analytics based on Automatic License Plate Recognition (ALPR), is proud to announce the successful integration of its ARES ALPR-based video analytics platform with XProtect open platform IP video management software (VMS) from Milestone Systems, the world’s number one open platform VMS vendor by company revenue according to IHS Research. Current and future users of XProtect will now have PlateSmart’s ALPR and analytics features available as an add-on without having to upgrade or replace any cameras or hardware.